Hotel Torino isn't overflowing with character, but it is an efficient and comfortable establishment. Rooms are well-equipped, although they vary in size. The breakfast room and terrace on the top floor are pleasant, but the hotel's prime attraction is its location. Between Stazione Termini and the Teatro dell'Opera, it is ideally located for public transport. We stayed at Hotel Torino anonymously in January 2005. Although much-travelled in Italy, as Rome residents we didn't have much first-hand knowledge of the city's hotels. Our initial impression here was good - reception staff were competent and polite. After we'd viewed our room, though, a slight disappointment crept in. It wasn't that there was anything wrong - more that there was nothing special - no exciting little luxury, no view, none of the features that make you think "It's so worthwhile paying for a four-star hotel". Our double room was rather small and basically furnished (nowhere to hang our coats), with a lingering smell of cigarettes. Over the course of our stay, though, we came to appreciate the merits of the Torino. The location was ideal. We arrived from Ciampino late at night by public transport, and were pleased we didn't have to travel onwards from the railway station - just a few streets' walk with our case. For getting about the city, and for trips outside town, Termini is the transport hub, and our location was very convenient. Although the immediate surroundings aren't scenic or historic, they are fairly safe (you won't want to linger around the station at night though!). Via Nazionale, with all its clothes shops, is only five minutes' walk away, and the Teatro dell'Opera is right around the corner - we really appreciated the two-minute stroll it took us to return after the ballet. Breakfast is eaten on the top floor, where there is a roof terrace. The buffet was good by Italian standards (breakfast really isn't a big thing here), with a selection of rolls, croissants, fruit juices etc. A word of warning: there are many tourist hotels around here, and lots of opportunistic restaurants have sprung up to relieve them of their euros. We wouldn't advise patronising these places (especially the ones with plastic photographs of dishes in the entrance). If you want to eat well, try the classy Target on nearby Via Torino, or head into the Centro Storico. A couple of friends stayed at Hotel Torino on our recommendation, and reported back very favourably. Their room was "large enough", they appreciated the nice bathroom and walk-in shower, and praised staff as very polite and helpful. And "breakfast was lovely - especially the stuffed croissants". 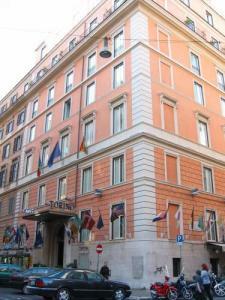 Hotel address: Via Principe Amedeo 8. From Stazione Termini head down Via Cavour (from the Metro take the exit labelled 'Via Cavour'). Then turn right onto Via Principe Amadeo and continue till you reach the hotel on the right. Hotel Torino review by Italy Heaven editors.